725 pages | 18 Color Illus. | 517 B/W Illus. 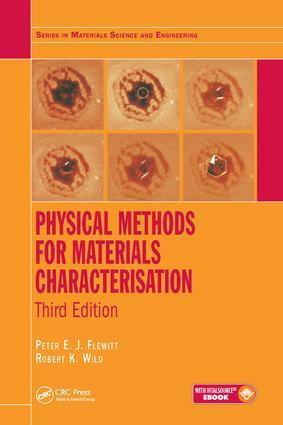 This completely revised and expanded new edition covers the full range of techniques now available for the investigation of materials structure and accurate quantitative determination of microstructural features within materials. It continues to provide the best introductory resource for understanding the interrelationship between microstructure and physical, mechanical, and chemical properties, as well as selection and application of techniques for both basic and applied studies. In particular, changes have been made to reflect developments in analysis of nanoscale and biological materials. "With its extraordinary comprehensive coverage, this treatise should serve not only as the basis for a graduate course, but also as a reference of first recourse for research scientists looking for the technique appropriate to their problem." "In its aim to provide a one-volume overview of a wide range of experimental methods for probing the structure of materials this book succeeds very well, and this updated edition is most welcome." Introduction. Interaction of radiation with materials. Vacuum systems. Diffraction. Photo/electromagnetic sources. Electron sources. Atom and ion sources. Application of computers.